Retreating from the Marne, the whipped Huns had fallen back on a strongly fortified line just north of the Aisne and Suippe rivers, with their right wing resting on the Oise at Compeigne and their left on the Meuse near Verdun, presenting a front of 120 miles. They occupied the crest of the Craonne Plateau, which rises sharply to an average height of 400 feet, some two miles back from the Aisne, and extending east from Сotpeigne, a distance of thirty miles. With characteristic foresight, the German engineers had constructed an elaborate system of trenches along the crest of this plateau during their pursuit of the Allies to the Marne. At intervals along the plateau front were placed the heavy howitzers and cannons intended to be used in the siege of Paris and which now commanded all the river crossings. In addition to this formidable natural fortress, the Germans had constructed a labyrinth of trenches in the Aisne quarries near Soissons, which had come under German control some five years before. There were miles of galleries and subterranean passages running through the quarries, enabling the Germans to conduct their operations with secrecy and safety. On September 12, 1914, the day the retreating German armies made their escape across the Aisne, von Kluck's army held the western end of the line, with his right resting on Compeigne. Opposing him were the armies of General Manoury, General French, and General D'Esperey. East of von Kluck's position and to the north of Rheims, were the German armies of von Buelow and von Hausen, facing General Foch. Farther east, in northern Champagne, the Duke of Wurttemberg's army confronted the forces of Langle de Carey. Above Verdun, the Crown Prince of Prussia was pressed by General Sarrail. Linked with Sarrail by the forts of the Meuse, the army of General de Castelnau was fronting the army of Crown Prince Rupprecht of Bavaria. Beyond them, in the Vosges, the armies of General Dubail and General Heeringen were opposed. 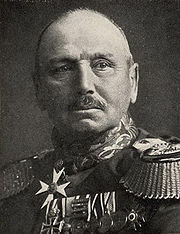 To prevent the extension of the German line westward from Verdun to the sea, General Manoury's left wing had been advanced north of Compeigne, thus flanking von Kluck. At the same time a general frontal attack was begun along the whole line from Compeigne to Verdun, a distance of 120 miles. This attack was ushered in by an artillery duel of great intensity in which the heavier German guns proved their superiority. From the commanding heights of the plateau, von Kluck's howitzers swept all the river crossings with a hurricane of shells. It seemed as though a sparrow could not survive the ordeal of fire, yet the dauntless Allies faced that roaring inferno without fear, arid laid their pontoons and rafts preparatory to crossing the Aisne River. With an intrepidity beyond all praise, the French poilus, under Manoury and D'Esperey, and the British Tommies, under Sir John French, succeeded in crossing in a dozen places between Compeigne and Soissons, and attacking vigorously up to the very edges of the plateau. Indeed, the French Zouaves advanced up the deep cleft of Morsaim, through St. Christophe, and seized the villages of Autreches and Nouvron on the continuing- spurs. Before daylight of September 14, 1914 Manoury's advance had reached far up the slopes within sight of the German trenches, but further it could not go. At daybreak, on the 14th, a British corps, under Sir Douglas Haig, who subsequently became commander-in-chief of all the British armies, stormed a section of the heights between Chavonne and Moulins, hoping to gain the Chemin-des-Dames ("Ladies' Road"), commanding the southern plateau from Soissons to Berry-an-Bac. Though they failed to reach their objective, owing to the fury of the German fire, they did secure an intrenched position on the plateau itself, within sight of the enemy's trenches, capturing 600 prisoners, 12 field guns and many machine guns. The Germans, in a series of violent counter-attacks on September 15, 1914, drove the French out of their posts on the crests of the spurs, recaptured Autreches, and expelled the French from the Morsaim ravine and the spur of Nouvron. Before sunrise the next day the French had fallen back to the bank of the Aisne. The Huns followed up this success by shelling Soissons, and did not desist until the town was reduced to ruins. Reinforcements were rushed to General Manoury and he in turn counter-attacked on September 17, 1914, driving the Germans back from the edge of the plateau to their main position behind Nampcel, clearing them out of the quarries of Autreches, where their batteries had caused such deadly havoc, and winning back all the evacuated ground. Further to the east, D'Esperey's French Army was assaulting in vain the German positions on the Craonne Plateau, while Foch's small army had fallen back from the Suippe River to a point outside Rheims, under pressure of von Buelow's and von Hausen's combined attack. In pursuit of Foch, the two German armies won the heights of Briamont, only five miles from Rheims, and the hill of Nogent 1'Abbesse on the east. From these hills, on September 10, 1914 the Germans began a ruthless ten days bombardment of Rheims. This bombardment, while serving no military ends, resulted in the partial destruction of the incomparable Rheims Cathedral and the ruin of a great part of the historic city. All Christendom was shocked by the needless bombardment of Rheims, and indignation grew when it was learned that the pagan Huns had made a special target of the Cathedral, the most beautiful edifice in Europe, as though they intended destroying all Christian evidences before restoring their sacrificial altars to Odin and Thor. The bombardment of Rheims, which began on September 10, 1914, reached the climax of its intensity on September 18, 1914, when the town was set on fire in many places; blocks of buildings were completely demolished and many inhabitants killed. It was now apparent that any further frontal assaults on the German line must prove futile. The Germans not only occupied an impregnable position, but in numbers and in gun-power they held the advantage. So elated were the Germans at their success in holding the Allies at the Aisne, that they were emboldened to renew their original plan of extending their line westward to the sea. General Joffre, divining this intention, had taken steps to forestall it. While Manoury's army was pushing northward about Compeigne on von Kluck's right flank, General Joffre had ordered the armies of Generals Castelnau and Maud'huy to transfer from the Eastern frontier and assist in his flanking movement. Moving with great secrecy, the army of General Castelnau, on September 20, 1914, came into position on the left of General Manoury, thus extending the Allied line northward from Compeigne to Peronne. Ten days later, General Maud'huy's new army had arrived and the Allied line was extended still farther north to Lens and Arras, within sight of the Belgian frontier. By this time the German right flank, instead of extending westward, had been bent back sharply from its apex at Compeigne in the shape of a gigantic L.
If it could be pressed back a trifle more, the Allies would be in possession of the Oise railway, the main line of German communications, compelling a general retirement across the French frontier. Or, if the French flanking movement could be carried farther north, the Allies would be enabled to relieve the Belgian garrison at Antwerp, then in great peril. On the other hand, should Antwerp be surrendered before the Allies had completed their flanking movement, nothing could prevent the German besieging army from advancing through Belgium to the capture of the channel ports. To be the first to reach the Belgian seacoast was now the aim of the rival armies. Their struggle to attain the objective is known in history as "The Race to the Sea." Even as General Joffre had used two new armies in lengthening his line northward and turning the German flank, so the Germans had transferred two armies to the bent wing of their line—von Buelow's Prussian Guards taking their position just north of von Kluck, while the Duke of Wurttemberg's Bavarians held the extreme right of the line. These two armies represented the flower of the German troops, as their generals were the most distinguished among the German commanders. The British army, then in position south of the Aisne and far from its base, was transferred to the north of the line in Flanders, where it could establish a new base, save Lille from hostile occupation, assist in the relief of Antwerp, and finally defend the channel ports. Another new French army, under General D'Urbal, was also hastened north to support the left of the line. The operations of the Allies, north of Noyon, were now intrusted to the supreme command of General Ferdinand Foch, whose brilliant generalship had marked him as the greatest strategist the war had produced. Under his direction the Allies won the race to the sea, but the narrative of the bloody engagements that ensued in Flanders, is reserved for another chapter dealing with the Battle of Ypres. During the Race to the Sea the Allied and German losses were each 25,000. 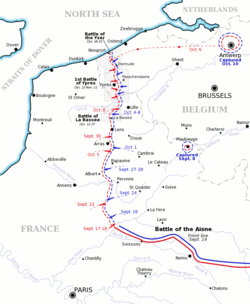 The First Battle of the Aisne (French: 1re Bataille de l'Aisne) was the Allied follow-up offensive against the right wing of the German First Army (led by Alexander von Kluck) & Second Army (led by Karl von Bülow) as they retreated after the First Battle of the Marne earlier in September 1914. The offensive began on the evening of 13 September, after a hasty pursuit of the Germans.